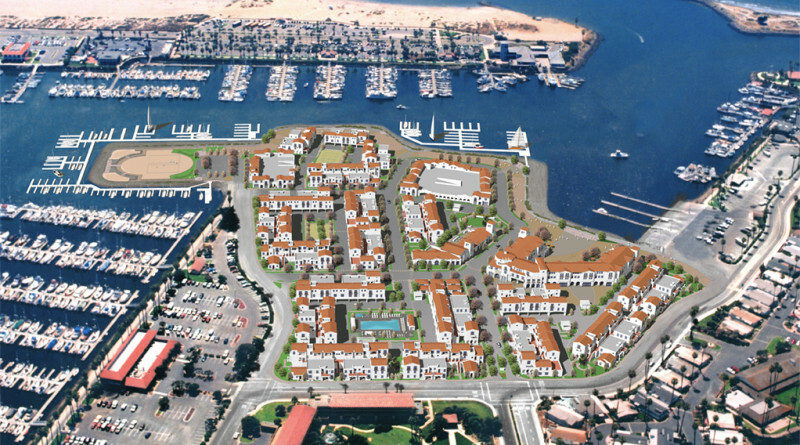 Portside Ventura Harbor would bring 104 boat slips, 270 apartments and a public dock to waterfront. VENTURA — For the second time this year, developers and public officials broke ground on a harbor area development project after more than 15 years of delays and deliberations. A groundbreaking ceremony was held at the proposed Portside Ventura Harbor site Dec. 7, setting the stage for a 104-slip marina and 270-unit residence to be built just off California’s south-central coast. The Dec. 7 groundbreaking in Ventura followed a similar event about 120 miles south at Dana Point Harbor, where Orange County officials finally put a shovel in the dirt to launch a waterfront revitalization nearly 19 years after the project was first delayed. The Sondermann-Ring project at Ventura Harbor has been in the works for about 16 years and was recently green-lit by the Ventura Port District Board of Port Commissioners. Port commissioners and city leaders hope the development, which could be completed by November 2019, would provide new recreational and open-space amenities at the harbor area, potentially complementing the recently updated Ventura Harbor Village. Once completed the Portside Ventura Harbor development would include 104 boat slips in a 44,000-square-foot marina, 90-foot public dock for kayak and paddleboard launching, 270 apartments, 30 live/work spaces, a water taxi stop, public access promenade, 2-acre waterfront park and 21,200 square feet of commercial and retail space. Port staff said the slips would accommodate boats from 30 to 80 feet in length. Plans presented to the Coastal Commission outlined what amenities would be included in the 104-slip marina. Proposed amenities included in-slip pump-out service, shore power, television/telephone hookups and six transient berth spaces for short-term renters. One transient berth would be reserved, at no cost, for nonprofit boating organizations. About 40 percent of slips would be set aside for 35-foot boats or smaller, according to plans. The marina would be built near the terminus of Schooner Drive. Ventura Harbor would be home to 1,352 boat slips – up from 1,248 – once the Sondermann-Ring project is completed. The project’s announced budget is $93 million and includes a $71 million bank loan. Ventura’s Port District and City Council have been deliberating the Portside Ventura Harbor project since 2000. An initial agreement was reached between public officials and the Sondermann-Ring team in 2002, but the project endured an additional 14 years of delays as multiple agencies, including the California Coastal Commission, weighed in on plans. A final vote on the project was recorded Oct. 5, when the port’s commissioners unanimously approved plans. Portside Ventura Harbor, which is the first major development at Ventura Harbor in three decades, was the brainchild of developer Michael Sondermann and attorney Doug Ring. Sondermann continued to see the project through after Ring was reportedly found dead at his Los Angeles area residence in 2009. Port District Board Chairman Jim Friedman, in a released statement, welcomed the addition of upscale apartments and expanding public open space at Ventura Harbor.